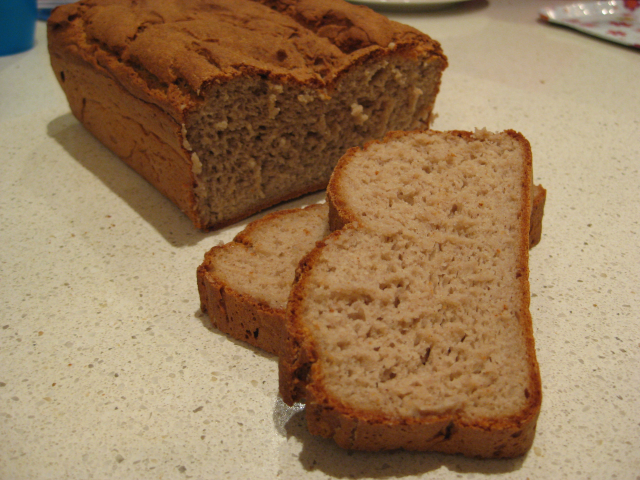 A nice loaf of bread that does not crumble and is not dry, this is my original “grain free” recipe from 2009. Suitable for children with a Salicylate allergy (yep, it’s failsafe). Gluten Free, nut free, soy free, egg free and dairy free AND it still tastes good! You need an accurate pair of scales for this recipe. 1/2 tsp sugar – plain white sugar for failsafe, I prefer coconut sugar or molasses, this is food for the yeast. 2 tsp xanthum or guar gum OR Soak 25g linseeds and 25g chia seeds in 100ml filtered water for 15 mins. IF YOU CAN USE EGGS: Add 1 egg and cut the water back to 400ml. The egg will guarantee a perfect loaf and removes much of the need to get the water ratio perfect. 2 tablespoons / 40 ml / 1.35 fl oz olive or coconut oil or a failsafe oil for failsafe version. Lightly grease and line with baking paper a small to medium bread/loaf tin. Sift all the dry ingredients into a large bowl. Add the yeast and make sure it is well combined/mixed. (SHORTCUT: I measure all the dry ingredients into a bowl including yeast and then just whisk it really well – it does the same thing as sifting and eliminates a step and fussing around with sifting). In a separate jug combine 500 ml of warm water with the oil. Spoon mixture into your loaf pan and smooth out the top. Leave to rise in a warm spot while you preheat the oven to 180ºC. Leave your bread to rise for at least 20 minutes or so, longer if possible. Bake for 50 mins in total – 40mins in tin, then remove bread from tin and return to oven upside down for about 10 minutes at the end of cooking until nice and golden brown on all four sides. This ensures that it is well cooked all the way through and gives a nice crust on all four sides. The bread is cooked when it sounds hollow on all sides when you tap with your knuckles. Place on wire rack to cool (not in tin or it will sweat). Wait until cool before slicing. It’s hard to resist I know but you need to let this bread cool down first!!! Using lighter flours like more potato or tapioca starch will mean you will need less water. Add it a bit at a time until you get the right sticky falling slowly off the spoon consistency. If it’s too runny weird things will happen (your bread will over rise when cooking and then collapse when cooling). Using heavier flours like more buckwheat, quinoa, amaranth etc will mean you may need more water. Add it a bit at a time until you get the right sticky falling slowly off the spoon consistency. If it’s too dry weird things will happen (your bread will not rise when cooking and then have the consistency of a brick). Don’t use too much tapioca flour – or if you do you need to beat your mix for about 4 minutes. Otherwise your bread will seem like it hasn’t cooked no matter how long you bake it. Thanks to my friend Kim who years ago developed the original recipe and shared it with me, and happily allowed it to be shared with you all.